Copper-based biocides are very effective at controlling biological contaminants in water, and are most often used to control algae and other organisms in irrigation ponds and reservoirs. Copper sulfate (“bluestone”) has often been used for this purpose. Recently, other “chelated” copper products have been introduced and are easier to dissolve and keep in solution than copper sulfate. Only a low concentration of copper (often less than 1 ppm) is required to control biological contaminants. Using a higher rate can endanger fish populations in the ponds or reservoirs. 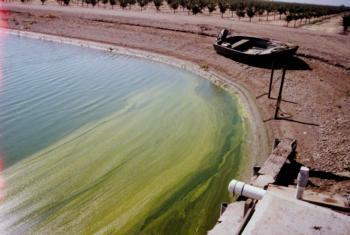 There are also some copper-based biocide products now on the market that can be injected into a microirrigation system. These provide an alternative to the chlorine products that have been the usual choice for an injected product. Chlorine is incompatible with some other chemical products that you might want to inject (e.g. phosphonate-based materials used to control chemical precipitation), and in such cases a copper-based biocide may be a good alternative.